Peanut butter and banana. Just peanut butter. Almond butter and honey. Just almond butter. Jam and butter. Just butter. Avocado and fried egg. Just avocado. Hummus. Yogurt. Cream cheese. And the toast-topping list probably goes on, which leads me to ask myself why landing on this recipe took me months? Because I spent d a y s digging through the internet for cinnamon roll recipes. Cinnamon rolls. Not toast. You know how to make toast and so do I, and by no means am I taking a stab at your intelligence level by giving you a recipe for toast with cream cheese. You'll see my purpose. Keep reading (pretty please). This portion of a recipe post - the text, the story, my thoughts - I take seriously because, since the moment I first started reading blogs (hi, Cookie and Kate and Pancake Princess!) I've enjoyed reading through snippets of the author's mind almost as much as trying and tasting the recipe. The blogs that share more than just recipes are the blogs that continuously pull me back in for more, as they allow me into their real lives with each post. It's more than food. The recipe portion of each post used to be the hardest part - the writing came easily. Now, I need at least an hour of me-time before sitting down to write and absolute silence while writing. Even then I sometimes stare at my computer screen or type and backspace and type and backspace repeatedly before sticking with an idea. Sorting through thoughts these days is nowhere near as simple as it used to be. Is that because I'm growing up and life's congratulations gift to me is more stress? Probably. Is it because I'm not reading as many creative words anymore (read: because I'm reading about metabolism and muscles and motivational interviewing and more)? Definitely. Is it because I'm not allowing my mind the time and space it needs to just b r e a t h e? Ahh. Ding, ding, ding. We have a winner. Silence is a seldom visitor anytime between 6 AM and 9 PM seven days a week. Can you say the same? Or at least something similar? I'll guess you can, because it's likely a true statement and knowing I'm not the only one (even if I have to convince myself) brings comfort. Whether the noise be background music during a workout, a podcast while walking to class, professor's lecture during class, and all the chatter and conversation in between - it feels inevitable. By the time I sit down at the end of the day to either write or plan recipes (when I put homework/studying aside for a second), I'm stuck staring at my computer screen again. Talk about frustrating. With all the time I spend filling my eyes and ears with Instagram, blogs, magazines, and podcasts about food and cooking, you might think I'd write about food at a million words a minute and plan recipes in no time. If only, if only. As my eyes grow more and more tired of the constant scrolling and my ears more and more worn out from the ongoing noise, I learn to give my mind the time and space it needs to just b r e a t h e, and it reminds me through the peacefulness of silence that I need time and space for breathing just as much as it does. 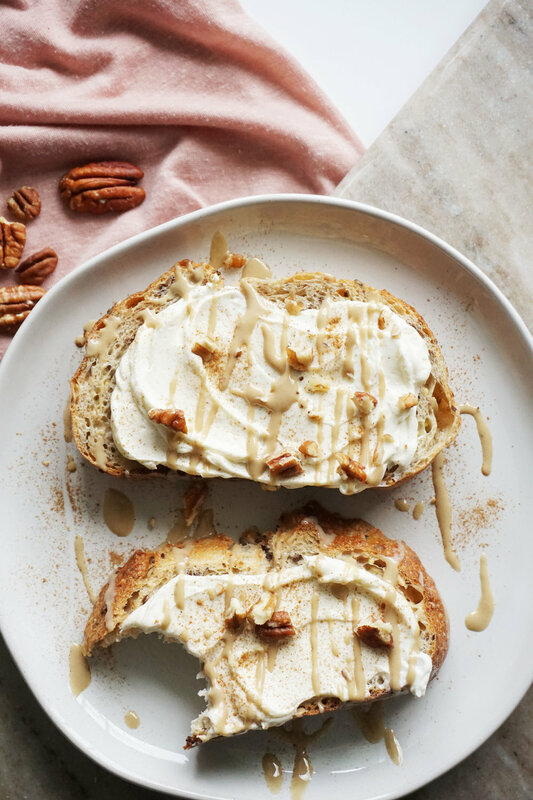 It reminds me that, as decadent and nostalgic and cherished as cinnamon rolls may be, cream cheese toast's simplicity is invaluable right now. In a large bowl, use a stand-mixer of hand-held mixer to beat together the cream cheese and Greek yogurt until smooth. This will take 3-4 minutes - every minute or so, stop the mixer and use a rubber spatula to scrape down the sides of the bowl and continue mixing. See the notes section below for an additional tip on the Greek yogurt amount. Next, add in the honey and cinnamon and beat for about 1 more minute on high speed, then transfer to a bowl of mason jar and set aside. Place the sliced bread in a toaster or toaster oven and remove when it's as toasted as you like. Arrange these on plates as you see fit for the amount of servings you plan to make. Spread 1-2 tablespoons of the Cinnamon Cream Cheese onto each slice. Sprinkle with additional cinnamon, a few crushed nuts, and a light drizzle of tahini (or other nut/seed butter). Store leftover Cinnamon Cream Cheese in an airtight container (I used a mason jar) in the fridge for up to 2 weeks. * If you prefer a fluffier, lighter Cinnamon Cream Cheese (similar to a whipped version), increase the Greek yogurt by 1 tablespoon, continue mixing, and test the texture after each addition, adjusting as needed.